D6 offers a full line of standard and custom liquid cold plates. From standard performance HydroBloks liquid cold plates to high-performance HydroTrak liquid cold plates. D6 offers off the shelf solutions or can work with you to customize a solution for your specific application. D6 product lines were developed to offer cost effective standard solutions as well as customizing these products. 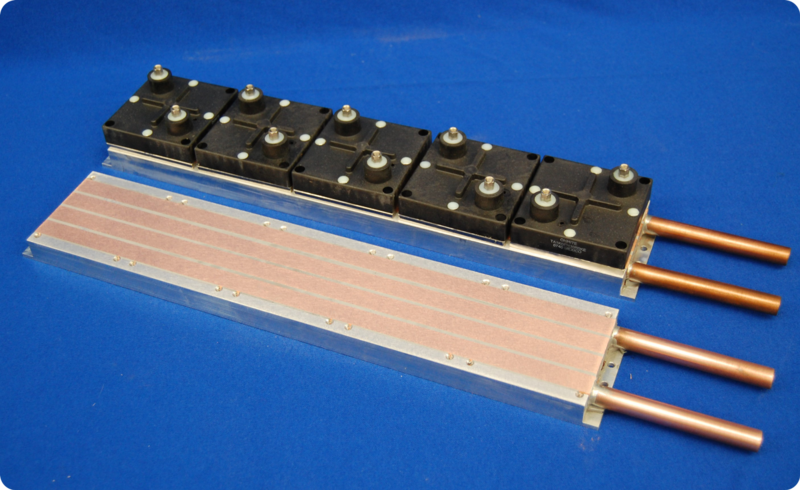 D6 designs and manufactures a full line of standard and custom liquid cold plates called the HydroBlok series. The HydroBlok series of cold plate are designed for high power density cooling for packages as small as a single FET to multiple IGBT device cooling. Hydroblok footprints are designed for any length of the liquid cold plate you need up to 6 feet. The D6 HydroBlok series of liquid cold plates are constructed using embedded tubing pressed into the base plate using high ton force with a channel profile designed to lock the tubing into place after the pressing. The HydroBlok cold plates are precision fly cut on the pressed tube side to give precise flatness for maximum performance. 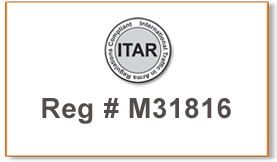 See specifications tab for some examples of our standard sized cold plates. Custom lengths are available. D6 offers this series of 2.25 inch wide 2 pass cold plates to meet the demanding needs of the power dissipation presented by IGBTs and Power Diodes. This plate provides a “U” pattern of 2 passes. A substantial area is cooled by 2 tubes and copper inserts, therefore providing a low thermal resistance between the device or devices and the liquid coolant. 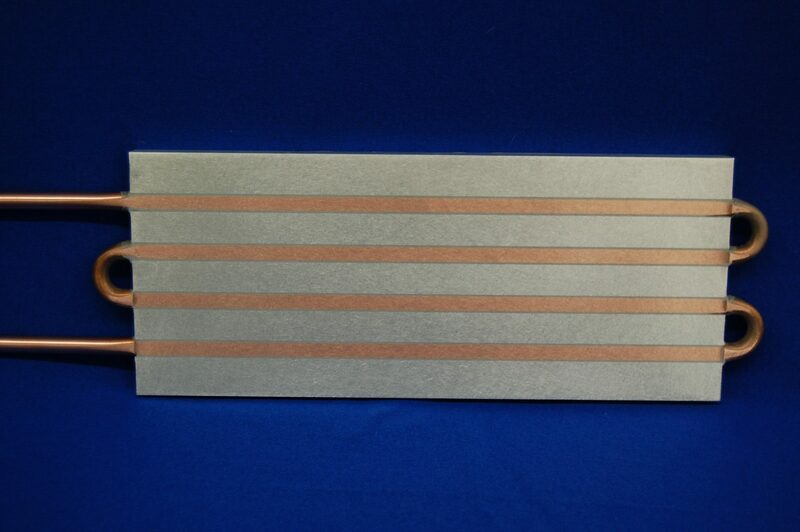 D6 offers this series of 5 inches wide 4 pass cold plates to meet the demanding needs of the power dissipation presented by IGBTs and Power Diodes. The 5-inch wide plate allows for 1 or multiple rows of devices with the tubing prepared in a serpentine pattern of 4 passes. A substantial area of each device is cooled by 4 tubes and copper inserts therefore providing a low thermal resistance between the device or devices and the liquid coolant. D6 offers this series of 10 inch wide and 7 inch wide 6-pass cold plates to meet the demanding needs of the power dissipation presented by IGBTs and Power Diodes. The 10-inch wide plate allows for 2 rows of devices with the tubing prepared in a serpentine pattern of 3 passes and then continuing in a second 3 pass pattern. 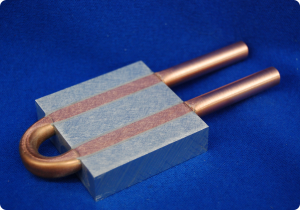 A substantial area of each device is cooled by 3 tubes and copper inserts, therefore providing low thermal resistance between the device and the liquid coolant. The D6 HydroTrak series of liquid cold plates use a patented design and manufacturing technique, making it a high-performance liquid cold plate. 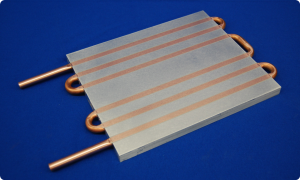 The HydroTrak products are a superior performance liquid cold plate technology. This product line utilizes a custom tube profile that improves surface area and heat conduction angles from the surface to fluid. The HydroTrak is embedded square tube designed with cooling paths and features that give Ultra high performance specifically for extreme power densities. HydroTraks can be placed within a base plate anywhere superior thermal performance is required to fit YOUR application and design. HydroTraks allow you to isolate the highest performance cooling under where you need it, making the HydroTraks the most flexible liquid cold plate technology. Standard products are available for the HydroTrak series. Custom lengths are available as well. The HydroTrak 2-Pass series was designed for a smaller footprint, high power devices. The 2-passes are spaced apart to allow for mounting devices such as SO OP, TO-264, relays, resistors, TO-247 and many other high power density electronics. The HydroTrak 4 Pass series was designed for midsize footprint, high power devices. The HydroTrak 4 passes are nested side by side allowing for standard power devices to straddle the cooling paths. The device mounting spacing is well suited for most IGBT, diode, SCR module devices. The HydroTrak 6 Pass series was designed for larger high power devices. The 6 pass HydroTraks are best suited for high power full module packages. 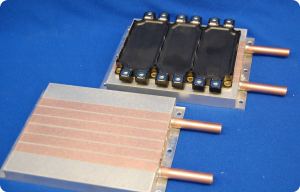 Low-pressure drop and ultra high performance make these units great options for cooling high power IGBT, SCR, Diode modules in the multi-kW range. 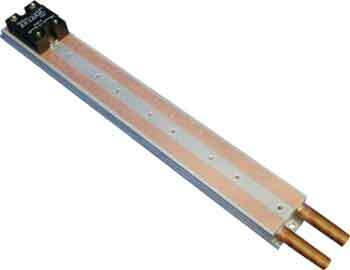 The HydroTrak TAP series was designed for high-performance cooling of high power resistor modules. 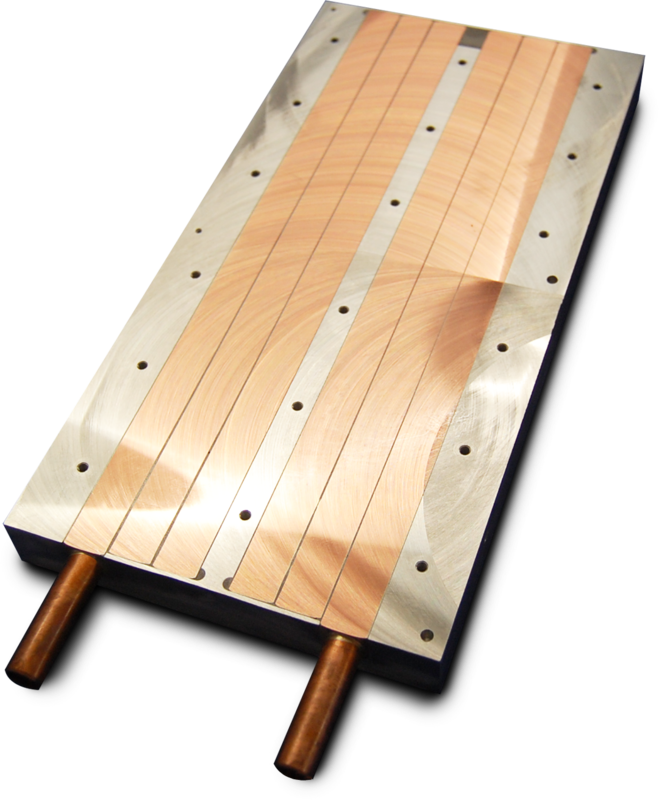 This series offers standard high-performance cold plates that accommodate from a single position to 5 positions of each of the high power resistors.